Peter Mishara created and directed a ten-part webseries that explores the first three decades of the video game industry. My name is Peter Mishara, I am a director / creative director working in commercials, documentaries and narrative – whatever I can get my hands on that moves me in some shape or form. Also work as a creative director for films and in online marketing. Born and raised in NYC, went to USC grad film school, and worked in the LA industry for 10 years. About 8 years ago, moved to Toronto and have been freelancing since. I saw an old advertisement for the launch of Electronic Arts in 1982. For some reason, the image of the group of designers whose games launched the company, photographed like rock stars, started making me think about the people behind the games and wonder what their stories were. Also, while I am a pretty big film nerd, in the mid-2000s I started playing games that at times began to rival my experiences from watching films, and I wanted to explore how this came to be – what were the games and who were designers that built this industry? I was working on a previous narrative short film, and I was finishing with a highly talented grader/colorist who swore by the plugin. It was as simple as that, once I saw the results, I couldn’t have been more on board. For several reasons – we shot primarily on a Blackmagic Mini Ursa 4.6K (which I was very happy with as well), but the nature of the beast when shooting docs like this – we ended up filming over 60 interviews – we shot with several different DPs with different gear. So combining all this different footage – including a c300 mk2, RED epic as well as some DSLRs, in different resolutions to boot – and giving it a unified look was where FilmConvert was amazing. Having the presets for each camera as a starting off point was incredibly useful. I also have to mention we had a good amount of archival materials as well as motion graphic sequences, and we ended up using FilmConvert on these elements as well – I don’t see that mentioned enough, FC combined with motion graphics really can provide a nice look. Pretty much every frame of this doc was treated with various amounts of FilmConvert. So the literal approach to this documentary is exploring the early history of video games. I guess that’s obvious. But the larger thematic idea that the series deals with is this incredible shift in the past 45 or so years from a wholly analog world to an increasingly digital one, and the ramifications that this has us on us individually and globally. 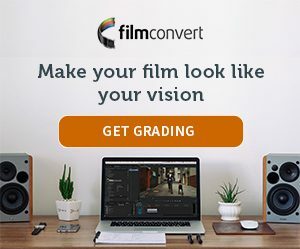 Its an apt metaphor for using FilmConvert – I’m from that era of film school where early digital cameras did exist, but we learned on and used film, which also I used in my early professional life – from 16mm Bolexes to Anamorphic 35mm. FilmConvert is easily the closest I’ve gotten to recapturing that feel in what is a completely digital pipeline. Since the nostalgia factor on a project like this is so high, I wanted to replicate that feel through the image, which FC let me do. As I mentioned before, our primary camera was a Blackmagic Mini Ursa 4.6k, which depending on the circumstance we’d shoot either 2k or 4k (the series was mastered in 2k), in QuickTime ProRes, always 444. Whatever camera we were using, we always shot with a flat dynamic range, we never tried to bake in an image. The entire project was posted on the Adobe Suite – main editing / color grade in Premiere with motion graphics in After Effects. I’d use the source camera and match it to whatever we shot on, if it was archival or motion graphics, I’d simply use the ‘default’ setting. Since a lot of our footage was locked off interviews, I could set a look and then apply it throughout. I’d mix the film stocks to get to a nice starting look and then tweak as needed. Maybe leaned a little bit more towards the Fuji stocks because of enhanced shadow detail but really ended up using a wide variation. Finally, if the image was clean, I’d use the ‘35mm Academy’ grain. I’d say that the overall look was pretty strong, but it fed into the overly filmic/analog look that I was going for. If I had footage that was too saturated or contrasty, I’d actually use the Premiere built-in Lumetri color grade to even it out to give it more of a high dynamic range look before adding FilmConvert. As an added analog look, I’d use Red Giant’s MisFire plugin to add a slight vignette and film dust, all attempting to give things an old school, cinematic feel.